This greatl knitted romper is designed to provide excellent protection for your baby. This wonderful knit romper by Nako designers was organized by Jessica Los. This pattern, with the front zippered, will be a stylish and beautiful dress for your child. 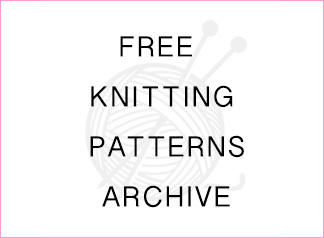 It is recommended that you use the number 3.5 needle for this knitting pattern. Yarn properties and colors are indicated. You can try different alternatives. If you follow to romper knitting steps, this romper knitting pattern will be easy for you. Note: I use the zipper, but you can also use the button. ROW 1 – 34 stitches start with yarn number 1199. After making 3 cm long, 1 + 1 rib stitch knitting, then will pass to 3 + 1 rubber knitting with yarn number 31373. ROW 1 – While the knitting size is 6 cm, one side of the net part is increased by 1 stitch 3 times by 2 rows from one side while the other side is increased by 1 stitch 6 times by 4 rows while it is at 10 cm. ROW 1 – While the knitting size is 18.5 cm, 43 stitch that are formed are held in the skewer and one more is knitted in the same way. ROW 4 – Increased sides for the network part are revealed and 3 stitch increments are made for the 43+ network, and then the same swelling is taken as + 43. ROW 5 – After 20 cm from the joining, 4 rows from both sides are searched 6 times and 1 stitch is cut to 77 stitchs. ROW 7 – While the body size is 60 cm, the stitchs for the collar are centered and the 19 stitchs in the middle are cut. From the next row, 3 stitchs are cut by the collar. When the body size is 64 cm, the remaining 23 stitchs on the shoulders are cut and finished. ROW 1 – The number 1, 2, 3 and 4 of the Back side can be performed here samely. 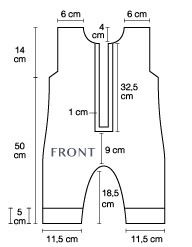 ROW 2 – When the body size reaches 9 cm as measured from the net part, the stitchs for the zipper are centered. Then, the middle 7 loops are cut and the knitting is continued in two pieces in the form of 41 + 41 stitchs. ROW 3 – After joining the legs, 15 cm is cut and the body is cut 6 times by 4 rows and 1 stitchs is cut and the stitchs are reduced to 35. ROW 4 – While the body size is 50 cm, 3 stitchs are cut for the sleeve house. ROW 5 – For the collar, 32.5 cm is woven from the front center and 3 + 3 + 2 + 1 stitches are cut. 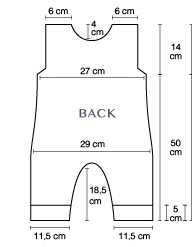 ROW 6 – While the body size is 64 cm, 23 stitchs on the shoulder are cut and the process is finished. ROW 1 – The arms start with 54 stitches with yarn number 1199. 5 cm 1 + 1 tires are woven and processed with yarn number 31373 and 3 + 1 rubber tie. ROW 2 – The number of stitches is reduced to 65 by making 1 stitch increase 5 times by searching 8 rows from both sides. 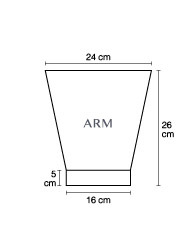 ROW 3 – Arm length is finished at 26 cm. What size is this pattern? The size of this pattern is 50×42 cm. Designed for 2-4 year olds. I like this design very much, but I have not found these yarns. Do you have any alternative branding suggestions? The yarn properties are contained in the PDF file. You can choose from similar yarns. If you have trouble with the pattern, please write here. I absolutely knit this design for my son. That’s exactly what I’m looking for. I do not understand some points. Can you help me please. I also think about making buttons instead of zipper. Are there alternative brands for knitting yarn you are using? I’m looking forward to your advice. Hi Katrina! We are waiting your question, also the button can be a nice choice. You can ask all your questions from my facebook page. Excellent pattern. This pattern is best solution for my baby. But I not understand some part, i’ll work.